We provide opportunities for our neighbors to learn about laws and policy impacting them, to advocate on issues that matter to them, to build relationships with elected and public officials, and to learn about the importance of and how to vote. We also monitor and share analysis of changes in the immigration system, policy, and state and federal legislation, advocating for common-sense reform. The Heartland Workers Center organizes campaigns to support civic participation among Latino/a people and other persons of color, and supports core teams of leaders in neighborhoods. 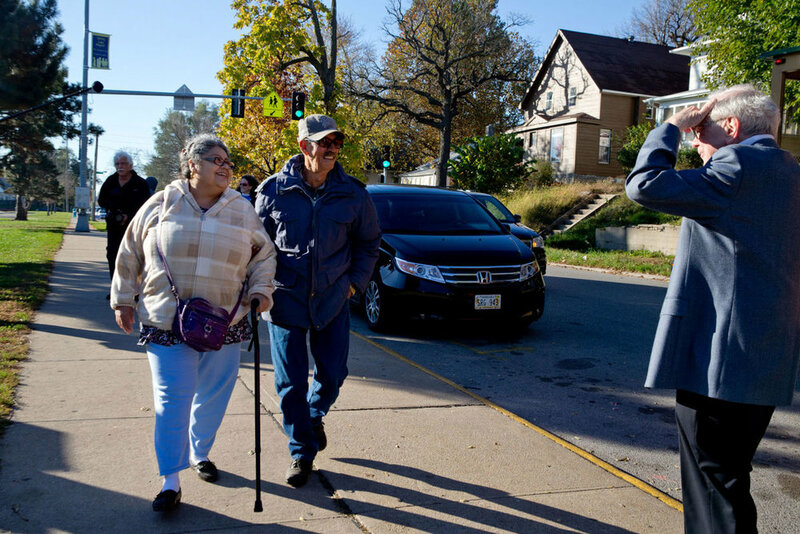 Retirees Pedro and Amelia Cruz attended a Heartland Workers Center-sponsored community gathering and signed up for a ride to the polls. Originally from Guadalajara, Mexico, the couple have been U.S. citizens for more than 20 years. They said voting is different in the U.S., but they have made conscious efforts to overcome language and cultural barriers to vote for their interests. During the ride to the polls, Pedro visited with a local business leader, trading stories and opinions. Pedro and the business leader came together, sharing about their different backgrounds and experiences for the purpose of exercising democracy as it is meant to be - collective.